Pre-Requisites: Access Expert Level 31 strongly recommended, as you should watch all of my classes in order. However, if you're skipping around, you should have at least completed the Beginner series and the first 3 or 4 levels of the Expert series where I start to cover functions. This class covers a wide variety of topics that we didn't get to in any of the other Expert series classes. We will begin by working with report grouping headers. 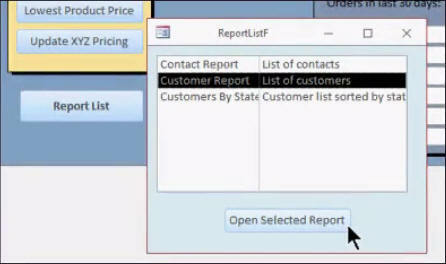 I will show you how to make a single letter header for your reports. 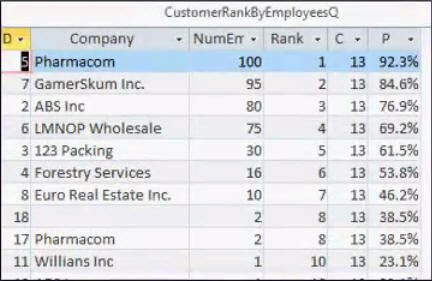 Next we will see how to generate a list of all of the reports in the database. We will use this list to create a custom form where the user can browse the list and then click a button to open that report. We will use a system-generated list first, and then I will show you a technique to create your own custom list so you can control what appears there. Next we will spend some time with statistics. The RANK, MEDIAN, and MODE functions are easy to implement in Excel, but Access is surprisingly missing them. You need to learn how to work with something called SubQueries in order to generate these values. So, that's what we'll do in this lesson. We'll also learn how to calculate percentiles. The upcoming Advanced series of Access lessons will focus on Macro Programming, so in today's class we're going to take a little preview so you can see what's to come. In this lesson, we're going to tackle one of the most commonly asked questions that I get: how to insert blank mailing labels on top of a label sheet. We'll learn a whole bunch of macro commands like GoToRecord, SetValue, InputBox, RunMenuCommand, and more. This is the 32nd class in the Access Expert series. If you're serious about building quality databases with Access, and you have any interest in charts, don't miss out on this course. Of course, if you have any questions about whether or not this class is for you, please contact me. Richard on 6/11/2016: Access Expert 32 covers a bunch of random topics that we didn't get to in any of our other Expert courses, including single letter report groupings, statistics like MEDIAN and MODE, plus an Intro to Macros. - Report Grouping Headers - Display a List of All Reports in Database - Generate a Custom List of Reports - Report List Form, Click to Open - Subqueries, Rank, Median, Mode - Insert Blank Mailing Labels at Top - Introduction to Macro Programming - GoToRecord, SetValue Commands - InputBox, RunMenuCommand - Lots more Click here for more information on Access Expert Level 32, including a course outline, sample videos, and more. This course was recorded using Access 2016, but most of the topics covered are valid for all versions of Access from 2007 on. This class follows Expert Level 31. The next class in the series is Access Advanced 1. Uriel R on 6/15/2016: Will the next Expert video explain how to use formulas from Excel in Access? I think it was mention during the comprehensive function videos, but I don't recall if it was done or not. This is more likely to be covered in the Developer series as it'll be using VBA. 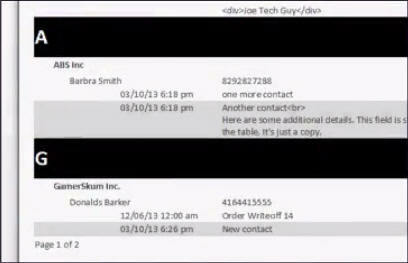 Robert S on 6/23/2016: When will the handbook be available? Hopefully I'll have time in an upcoming weekend. Do you have any feedback on the handbooks? Dennis Owens on 7/12/2016: I am already receiving Access 301. I am up to Access 304. Do you have a possible release date for Access Advanced Level 1? I want to receive Access Advanced Level 1 as soon as it is released. I think it's on the Waiting List, or Pre-Order, not sure when the release date is. As long as it is free to me, I would love to have it. Do you work for free? Richard puts a lot of time and money into making the videos. If you like the training videos then support him for his great work. They might be a MyOLP customer. Hardatt Trivedi on 10/1/2016: I need to read all excess exert topic. I've written most of the handbooks for the courses, if you have bought the video course you can buy the handbook too.